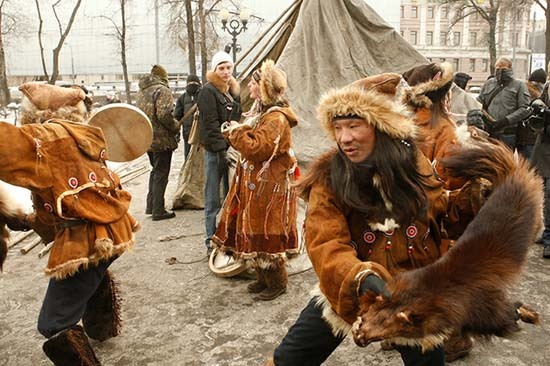 The traditional bear ceremony of the closest linguistic relatives of us Hungarians, the Khantis and Mansis living along the Siberian Ob river, has more than one purpose. 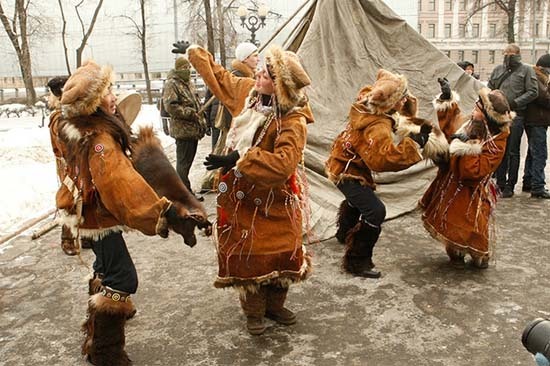 They primarily try to placate the spirit of the bear slain, to turn away from themselves the suspicion of his murder, and to make him believe that he fell victim to a simple accident. However, ethnography has probably never recorded any case when the Khantis and Mansis held a ceremony to drive away the bear. Nevertheless, this is exactly what happened the day before yesterday in Moscow. 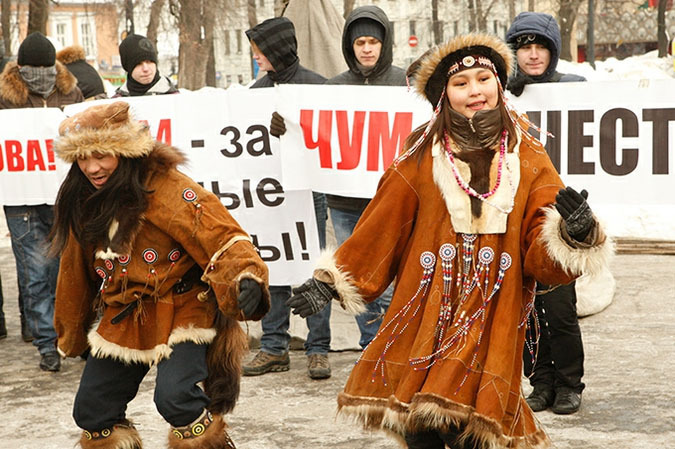 The Nezavisimaya Gazeta announced already in late January that the “Fair Russia” which defines itself as a leftist party – and which tries to make itself appear as the opposition of the Kremlin, while many consider it a creature of the Kremlin itself, and it is a fact that the party and its leader, chairman of the upper house of the Russian parliament Sergei Mironov has always firmly supported Presidents Putin and Medvedev – intends to nominate as a candidate for the parliamentary elections of 13 March in the Khanti-Mansi autonomous territory (also called Yugria) a local electrician called Dmitry Stalin. However, the Council of Elders of the two ethnic groups have protested in an open letter addressed to the Kremlin not only because of the Russian – that is, not indigenous – origins of the candidate, but also because they regard it as an ugly trick against the purity of the elections that in the middle of the nostalgia for Stalin growing all over Russia the Fair Russia tries to gain an unfair advantage with the name of the candidate. 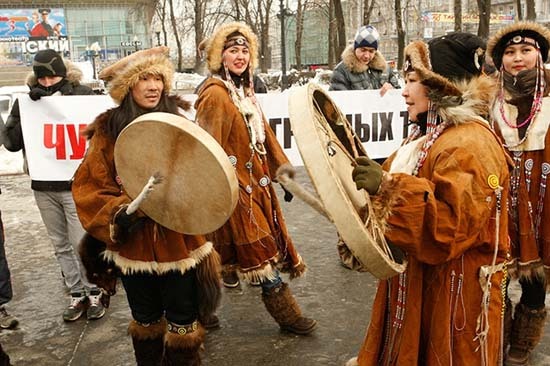 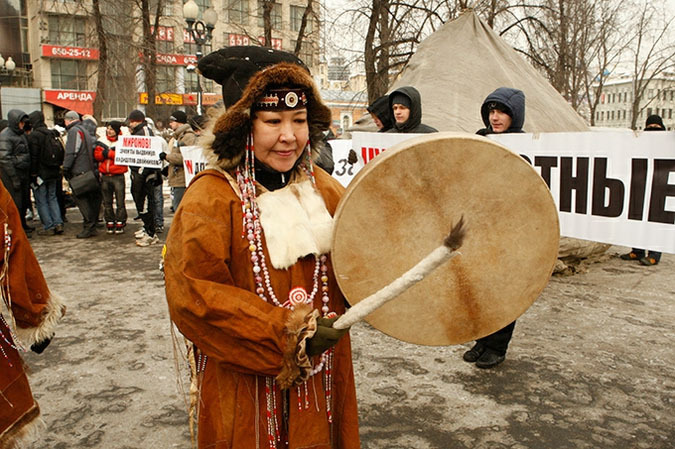 The secretary of the ethnic organization “Saving Yugria” has already said that they would hold a demonstration with tents and shaman dances in Moscow, in front of the Russian parliament. According to the MariUver Finno-Ugric blog in the previous weeks they already held a number of similar demonstrations in the largest cities on the way from Yugria to Moscow, * but the Russian blogs published photos only on the spectacular performance of the day before yesterday in Moscow. 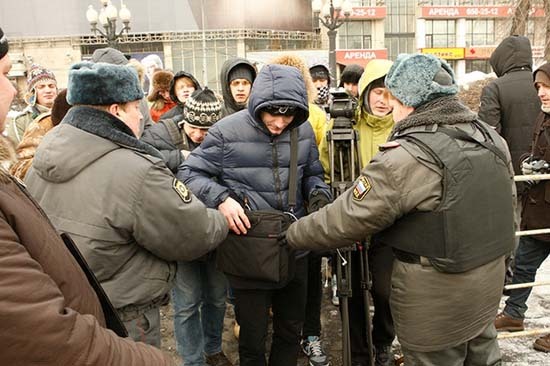 The best photos could have been taken by Ilya Varlamov, a constant witness to all Moscow demonstrations, had he not been in delay. 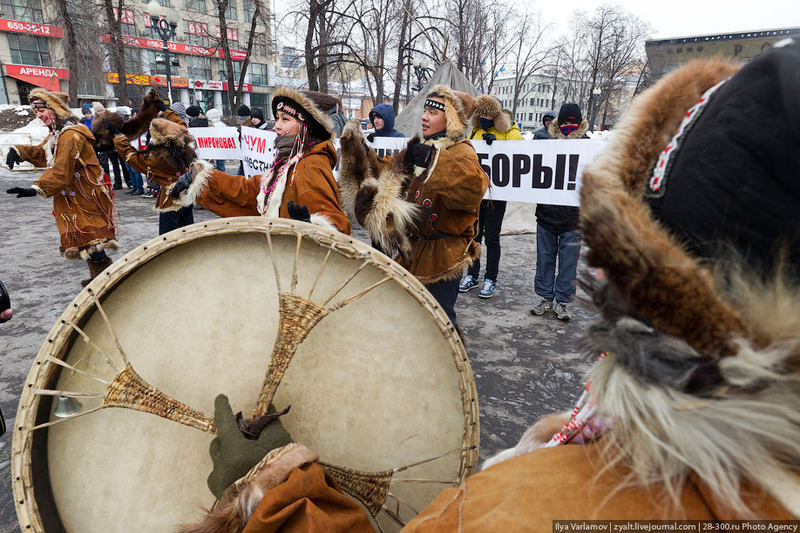 Nevertheless, even so he was able to publish some well-captured moments of the end of the event. 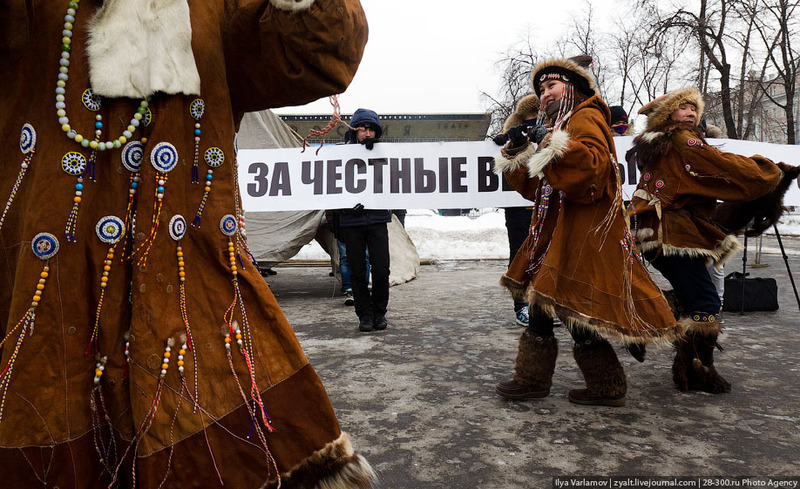 The main part of the demonstration – as well as the already almost ritual police searching – was documented with some good pictures by Alexandr Basalaev and Vasily Ivanov. 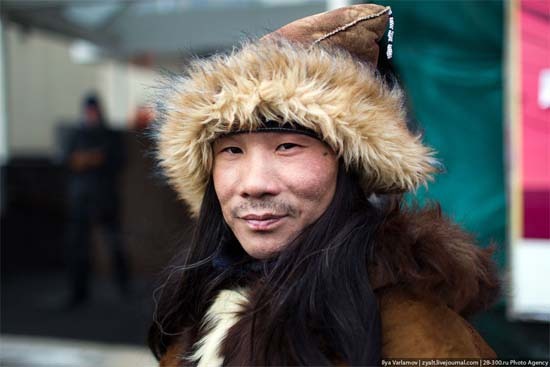 It is not yet known whether the ceremony will cause the party to withdraw its candidate of such a big name. And it also indicates the lack of transparency of Russian internal politics that according to the MariUver blog the “Saving Yugria”, organizer of the demonstration, has been since 2008 a member of the local advisory board of the ruling party. 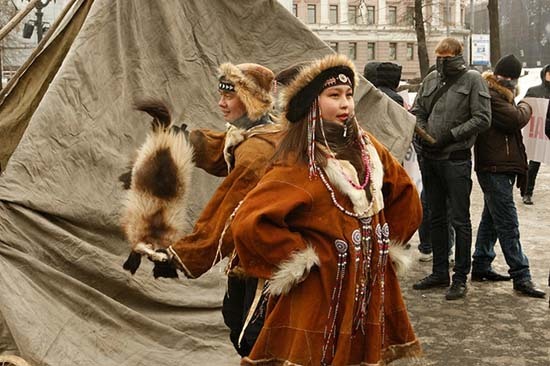 Anyway, the spectacular presentation and its coverage at least call attention to these small Ob-Ugric peoples which are seriously threatened by assimilation.